Continuing from last week we have the completion of the British Railways 63ft autocoach trailer. All of the handles, hinges, buffers, auto equipment and small details were added to the external model. Then the interior walls and floors were placed with an eye to the varying seating arrangements for the four different diagrams that will be created. Next, one of the sets of seats and all of the interior detail were placed including the drivers vestibule with it's set of controls that include brake, regulator, sander, whistle cord, foot peddle for the gong and the ATC unit. For anyone who doesn't own our GWR Class 14XX Loco Add-On we have created a working trailer which allows you to drive from the coach with all of the real controls and bell communication system that a driver and fireman use when operating this unusual set up. The BR trailers and appropriately fitted pannier tanks with this new pack will use the same system and be fully compatible with everything in the 14xx add-on. And for a bit of a change from the grey renders, a look at how a simple colour pattern is added in preparation for the first coach being loaded into the texturing program. 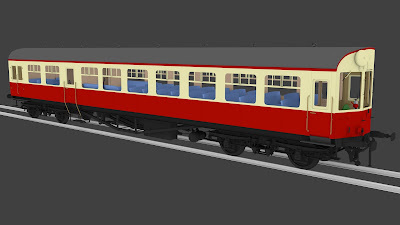 The final versions of each coach will be the provided in this Crimson Lake & Cream as well as the later Maroon livery. Next week we'll have more work in progress detail of this bumper pack... it could be the start of the 5700/8750 modelling or possibly the first in-game pictures of the 5400/6400/7400. Be sure to come back and check it out. Ever since we produced the 14xx and GWR Autocoach pack people have been asking us to build a BR autocoach and now we are creating the appropriate pannier tanks it is the perfect time to do just that. So after poring over some specialist books and looking at preservation examples it became clear that the most popular choice would be to produce the 63ft trailers built in two lots in 1951 and 1954. 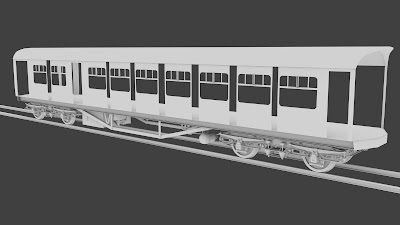 There are 25 trailers in total which gives a nice choice of numbering and also there are 4 diagrams within the build to provide some variation. The diagrams are A38 (No.s 222-234), A39 (No. 220), A40 (No. 221) and A43 (No.s 235-244). Another deciding factor was that this group contains two named trailers - specifically No. 220 "Thrush" and No. 221 "Wren". So with that decision made work has begun on the modelling. 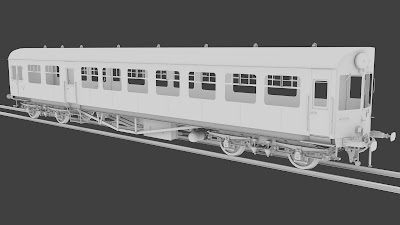 The bogies were taken from another coach model and then rebuilt with a lot more detail added and then the under-frames completed to match. 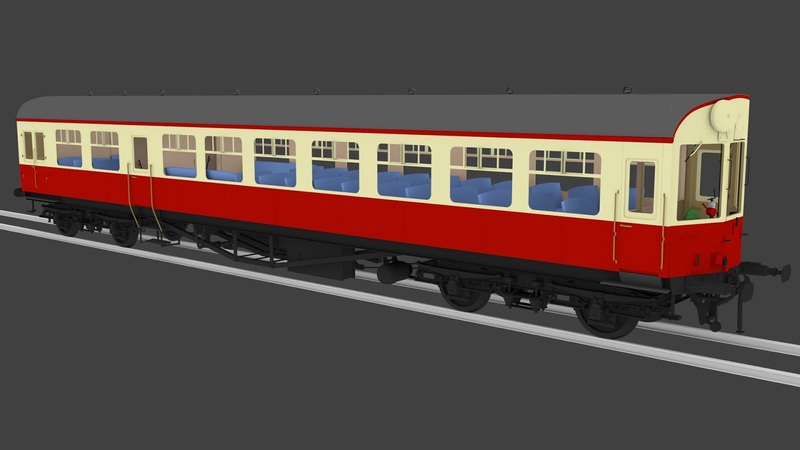 Next up was that distinctive BR metal panelling and window shape which was duplicated all the way along the side. The panels were joined together and the doorways and doors put in place. The ends were closed off with the correct shape from the roof overhang. Front windows were cut from the driving end with improvements to the chassis detail and placement. Vents were added to the roof. 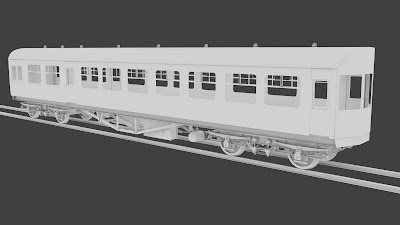 Next week we should have the outside of the trailer completed and can start working on the driving cab and those different seating arrangements. 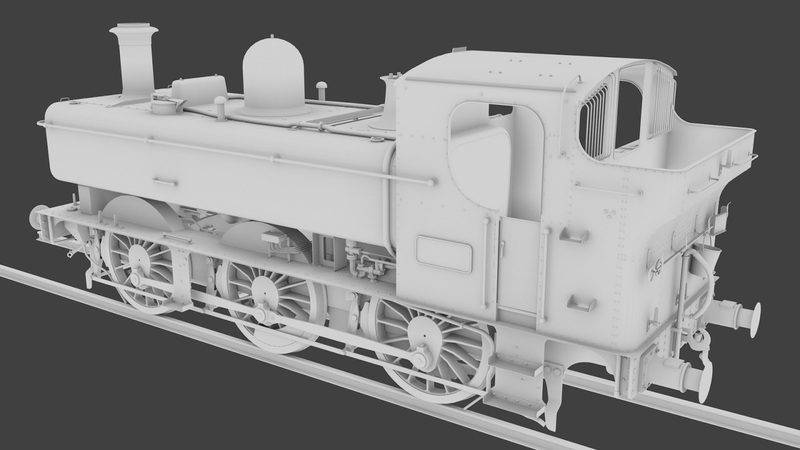 For 3 days only on Steam the GWR 1000 Class 'County' Steam Loco Add-On is on sale for 25% off. This is the first time that the County has been on sale and a great chance to pick up the final chapter of the Great Western Railways mighty 4-6-0 classes. Today we're taking a look at the 54xx, 64xx and 74xx classes and the options that will be available with these engines. First up is the 54xx in it's original form, numbers 5400 to 5419 built in 1930. All 54xx and 64xx were fitted with auto-gear to work with auto-coaches and these engines will all be compatible with the GWR coaches from the GWR Class 14XX Loco Add-On as well as the BR autocoaches included with this new panniers pack. The 54xx fleet was expanded with 5 more engines, numbers 5420-5424 in 1935 and in the next 10 years modifications were made to add a whistle shield and bunker steps in the late 30's and between 1943-46 half of the class were fitted with an improved top feed water injector system. 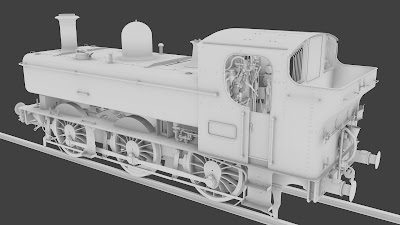 Each of these parts can be activated and de-activated to represent the 54xx at any stage of its life. The 64xx class was built in 1932, starting with numbers 6400-6409 and rapidly expanded with numbers 6410-6429 by 1935. Running a smaller wheel diameter than the 54xx (4' 7½" instead of 5' 2") it shared the same cab design as the larger wheeled predecessor. In 1937 the 64xx class was expanded again with numbers 6430-6439, this time with a square corner on the rear of the cab and a roof without overhangs. The whistle shields and bunker steps of the 54xx design were added soon after. From 1943 some members of the 64xx were also retrofitted with the new style of top feed. The 74xx class was started in 1936 with numbers 7400-7429. 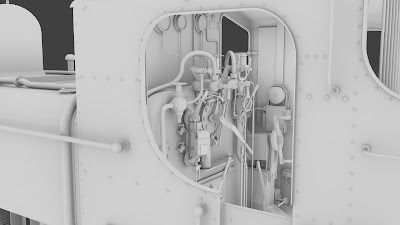 Boasting a boiler pressure increase from 165 psi to 180 psi and using the square cab design of the later 64xx's, the 74xx class was not designed to be used with auto-coaches and so lacked the relevant equipment. Due to this they were also fitted with a lever reverser rather than a screw type (the lever being quicker for shunting duties but not as suitable for use when the driver and fireman had to work remotely from each other). As with the other types; shields, steps and top feeds were fitted at similar times. All of these parts will be fully selectable so you can modify any of the variations to match any specific engine you choose as well as being set up with suitable numbers for each of the GWR eras so you can drop and play, as well as relevant quick drives using the included BR auto-coaches. And speaking of auto-coaches.. come back next week and we'll see how those are coming along! Summer is nearly over, harvest time is coming. Therefore it must be time for... another sale! Exclusive to the Dovetail Store, our products are heavily involved in the Pro-Range Sale from today and the following discounts are available until September 17th. If you haven't purchased from the Dovetail store before, then fear not! It's all above board, owned by Dovetail Games themselves and any purchase will provide you with a key to add the DLC directly to your Steam account just as if you had bought it from Steam. And don't forget that every one of our Pro-Range products is carefully designed to work in Simple, Standard and Advanced modes as well so anyone can enjoy them. Click this link to see all of our DLC on the Dovetail Store or click on an image below to view a particular DLC. GWR 56xx - 50% off - Did you know that this was the first ever "Advanced" steam engine released for Train Simulator, all the way back in June 2011! After a nice summer break work has been continuing at pace and the 54/64/7400 model has reached completion. 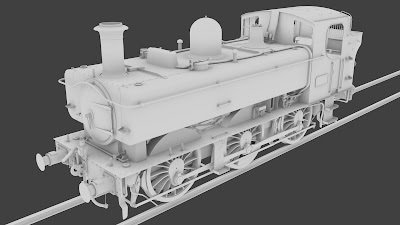 Here we see the model from the previous blog with the basic shape of the cab added. 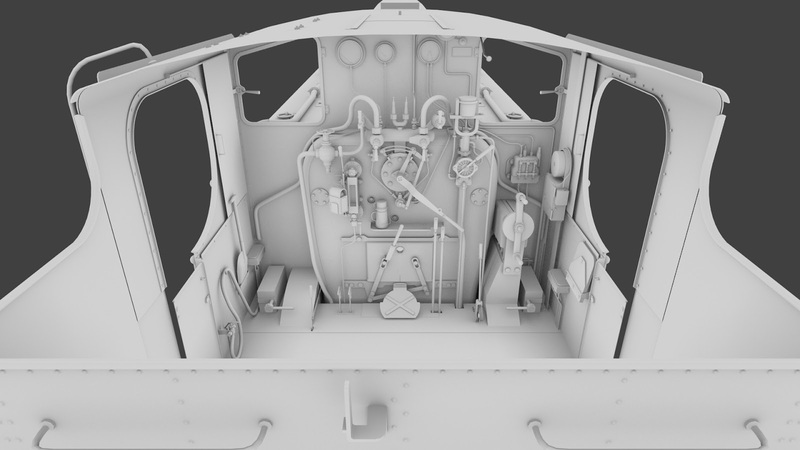 A view from the fireman's side looking in after all of the components have been built and added. With the back wall removed you can see how things are laid out. This is the 5400/6400 variant with the screw reverser, which was standard for autocoach working. The 7400's had a lever reverser and were not fitted with auto gear. And finally a rear quarter view of everything completed. 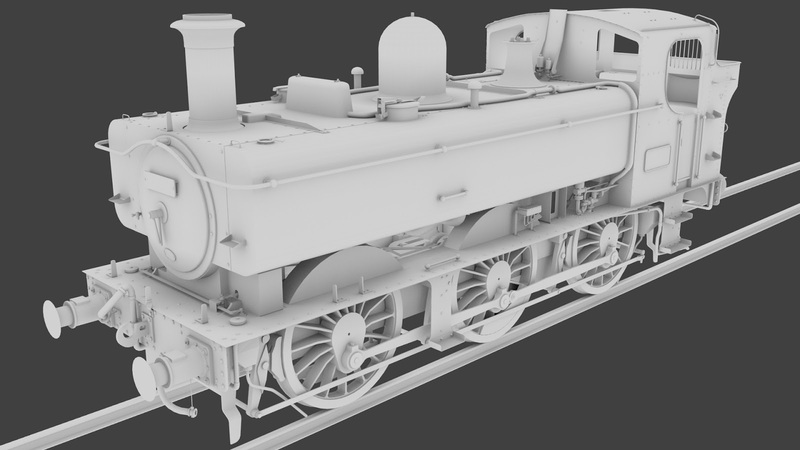 Next time we'll take a look at the engine with various elements removed, added and changed to show what kind of options will be available.